Kairuga is my first released game. A mini-game, as well. Last summer I threw it in the GMG; seeing that it is dead at the moment and that GM7 has come out, I've decided to release the final version here with Vista compatibility. I think it's fine the way it is, and I have other projects to work on. If you have played Ikaruga before, then you won't be too alienated from the concept. If you haven't, I suggest you read the README_FIRST file included in the download. The controls were originally the japanese standard ZXC but due to problems for foreign keyboards the default was changed to ASD and custom controls are in place. Someone else had also made a video showing Kairuga in hard mode. You could check that out as well. Both are on that page. My video is Kairuga in normal mode running on a 64 MB shared memory integrated card. As you could see, performance was pretty bad. I still reccomend reading the README_FIRST. Enjoy the game as much as I did making it. Remember, the README_FIRST file is your best friend in case you do not understand how to do certain things. Please comment on how I did with a first-release game. I think that the graphics was the best part, second are the chains and... yeah, the chains were horrible to code. Obviously higher difficulty = higher score. Kairuga Run - Hard, 85 Chains. Edited by Kairos, 20 April 2007 - 12:22 AM. I in fact own Ikaruga for gamecube, and have beaten it on easy and normal. This, my friend, is a very well made game that not only retains the same difficulty factor in Ikaruga that we have all grown to know and love, but also retains the same fluid visuals that made Ikaruga one of the best vertical shooters ever created. The collision detection is forgiving (as in the original), the music is, well, the same, and the graphics are superb. This is one of the best Gamemaker games I've seen in a while, and I've lurked around the forums for about a year now. Edited by RPGillespie, 14 April 2007 - 05:48 PM. Thanks for comment. However, this is a mini-game only and I may not put thought on 2 player co-op. Perhaps for another game, or unless in the future if I ever want to expand upon Kairuga (I don't know about the chance.) As for now, enjoy it, it actually has been out for a long time and I never really remembered to post it here. Final version. At least for now until I ever decide to do something similar. Edited by Kairos, 14 April 2007 - 05:49 PM. Added a second mirror, server should be ok by now. This is a bit weird... Earlier today I played some Ikaruga for the first time in months, and then I came here to the GMC to look for my old Ikaruga project (I can't find it though). Then I found this. The game is very well done and it's pretty similar to the original, except for a few changes. I would love to see more stages even though it probably won't happen. Good luck with your other projects. Game Maker user since 2000 - Nova HTML Converter v3 released. Thanks for the comment, and it probably won't happen, mainly because of lack of time to create such a huge project. The boss for the first stage was already killer; I can't possibly imagine making 4 more, which all are rather complex as well. Edited by Kairos, 14 April 2007 - 06:32 PM. I found this game on a website (the demo of course) around the time I bought Ikaruga. Nice to see the final version is finished. By the way, I didn't realize how well you copied the game until now, the enemy waves are almost identical to the original, and you did an awesome job on the boss as well. Bullet eating also gives a good boost to score. Edited by Kairos, 14 April 2007 - 07:35 PM. Wow, that game was incredible. I love Ikaruga, so this is staying on my computer. I couldn't find anything wrong with the game at all. 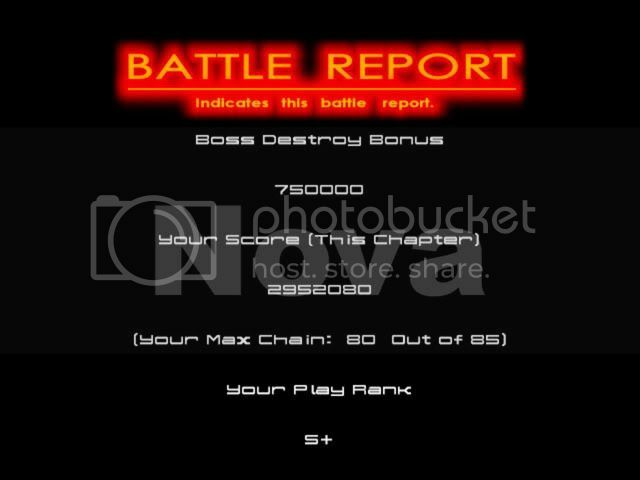 Oh and my score was 760620. Added videos for viewing pleasure and for geeks who want a video of game play before downloading anything. Edited by Kairos, 15 April 2007 - 09:35 PM. Edited by Nova, 17 April 2007 - 05:29 PM. Nice job! Highest I've seen so far from players. Although I'm too lazy to change it, and it won't be too much of a big deal. I'd like it if more people commented instead of just viewing and downloading too, you can never have enough feedback. Heya this is an awesome game. Couldn't find anything to criticize -except maybe the lack of levels. The music comes out a bit distorted after restarting the game numerous times (I think we had that before eh? ), the only way to fix this is to close and start the game again. I still suspect that you initialize sxms multiple times. Do you by chance use game_restart() to restart the game? If so know the initialisation-scripts are also being called at each restart. I suspect you don't plan on adding any more levels or content to it? Edited by 9_6, 28 April 2007 - 11:27 PM. Hi, remember me? I think when I played this earlier, I commented on adding controller support. Did you add that at all? I reviewed your game on the YoYoGames website. I'm a big fan of Ikaruga! I guess the review may have been kind of bias. But anyway. Are you one of those really good Ikaruga players who can get like infinite chains and beat all the levels on Hard? If so you should upload some videos on youtube of it. Oh and my highest score on Hard so far is 1706960. I have an image but ImageShack is working for me right now. I did bad on the boss because I only had one life left and I didn't want to get game over so I took him the easy way. I also did kinda bad because I wasn't used to the controls. Peace! Edited by fuse, 29 April 2007 - 02:46 PM. I've achieved 30 million in Ikaruga. I have videos of that run, but there are some better ones out there. You should check out ikaruga.co.uk (if it's still up that is!). About my earlier comment for controller support... I downloaded it and tried it again, and I would settle for being able to use spacebar to shoot. But currently, that key pauses it. Can that be changed? Yeah I have been there actually and seen some of those players. And damn 30 million is a good score I can barely pass medium. I just didn't have enough time to add any controller support, sorry Jugem. I'm finished with the game currently. I don't know if I'll add any more levels in the future, and add other support, but who knows. As of now I'm extremely busy with school with barely any time to go back to my projects. No chance of adding the ability to use Space as the fire button? That wouldn't be too difficult to do, would it? Well, I understand if you're too busy to do anything more with it though (or if you just can't stand working on it anymore!). Found the game on mbnet.fi ( finnish computer magazine) as the game of the day. I'm a big fan of Ikaruga and this represent very much the original. Incredible game there, and it doesn't even lag. Extremely professionally made. I went to settings then after i fixed controls i pressed start and i got that error witch i just pressed ignore on, and i worked. Smooth game! This game was so great that it made me want to get Ikaruga itself! But i don't own an X360, and the gamecube version is impossible to find, so i risked my computer by getting an emulator, ISO and a torrent. And i'm scared of those things destroying my comp. Great job at converting me. I might try Varia Soon. This is by far the best game I have ever seen on this forum. Excellent work! I love everything - the design, the sound effects, the graphics, the music, 100% awesome game! I got a score on 1205740, not awesome but fun as hell! 10/10 from me, best regards from Sweden! Edited by Mysteria9, 01 August 2008 - 12:24 AM. hah hah... VERY NICE.. Cool Graphics.. extraordinary Sound FX..
Hai.. The day is nice! Wow, I am a big fan of Ikaruga on the gamecube. This is just amazing. 9.75/10. Agent-Third Person Shooter -"Wow! That was the best 3d TPS I've ever played on GM!"